In 1955 S&S Express was established as a Local Cartage and Specialized Services company that worked with various freight companies. 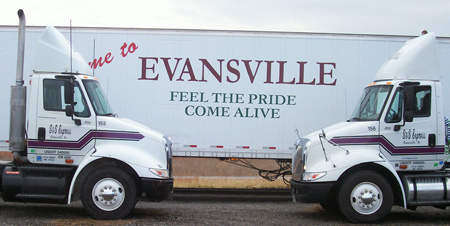 The road to success for the company began with just two straight trucks and one tractor. The company began to grow and in 1967 and with the promotion of Jan Smith to Vice President, the company continued to expand. In just a few short years, S&S Express evolved into a freight company and for the last 55 years has been providing their customers with customer service that is second to none in the freight industry. The staff and drivers of S&S Express pride themselves in not only outstanding customer service but delivering dedicated, specialized and on-time service that makes every customer inter-action an unparalleled experience. As S&S Express continues moving forward into the 21st century, the company continues to grow and evolve into an industry front runner for Local Cartage and Specialized Service in the tri-state region. Our services currently cover a seven state area throughout the Midwest. If you have any questions, concerns or just need more information about our dedicated and specialized freight services feel free to contact us today. We look forward to working with you and becoming your Tri-State freight carrier.